Paul Clayton starts to celebrate after scoring Alfretons third equaliser. Paul Clayton will remain at Vanarama Conference North club Harrogate Town until March 31, after his loan from Alfreton Town was extended. The Reds have a 24-hour recall clause for the 30-year-old who hasn’t played for Nicky Law’s side since December 20, 2014 at home to Macclesfield. 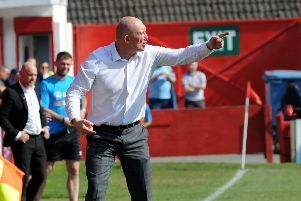 “Paul has had a spell out on loan, he has started playing games regularly and has scored a couple of goals recently which is pleasing,” said Alfreton boss Law.